.addBack() : Add the previous set of elements on the stack to the current set, optionally filtered by a selector. Example Add class "background" to all the "div" having class "after"
.ajaxSend(): Attach a function to be executed before an Ajax request is sent. This is an Ajax Event. Whenever an Ajax request is about to be sent, jQuery triggers the ajaxSend event. Any and all handlers that have been registered with the .ajaxSend() method are executed at this time. Example ajaxSend will be called automatically when ajax is about to be sent. .ajaxStop(): Description: Register a handler to be called when all Ajax requests have completed. Example Whenever an Ajax request completes, jQuery checks whether there are any other outstanding Ajax requests. If none remain, jQuery triggers the ajaxStop event. Any and all handlers that have been registered with the .ajaxStop() method are executed at this time. The ajaxStop event is also triggered if the last outstanding Ajax request is cancelled by returning false within the beforeSend callback function. .ajaxSuccess(): Attach a function to be executed whenever an Ajax request completes successfully. Example Whenever an Ajax request completes successfully, jQuery triggers the ajaxSuccess event. Any and all handlers that have been registered with the .ajaxSuccess() method are executed at this time. .contents(): Get the children of each element in the set of matched elements, including text and comment nodes. 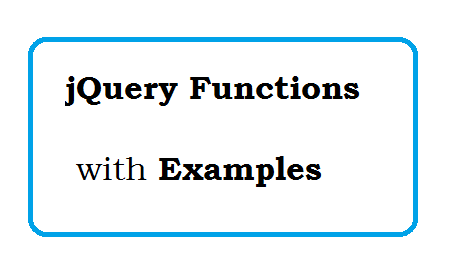 Given a jQuery object that represents a set of DOM elements, the .contents() method allows us to search throughthe immediate children of these elements in the DOM tree and construct a new jQuery object from the matching elements. The .contents() and .children() methods are similar, except that the former includes text nodes as well as HTML elements in the resulting jQuery object. Ajax technical interview questions and answers for experienced. Ajax Interview Questions and Answer for Experienced. Json Interview Questions And Answers For Freshers.